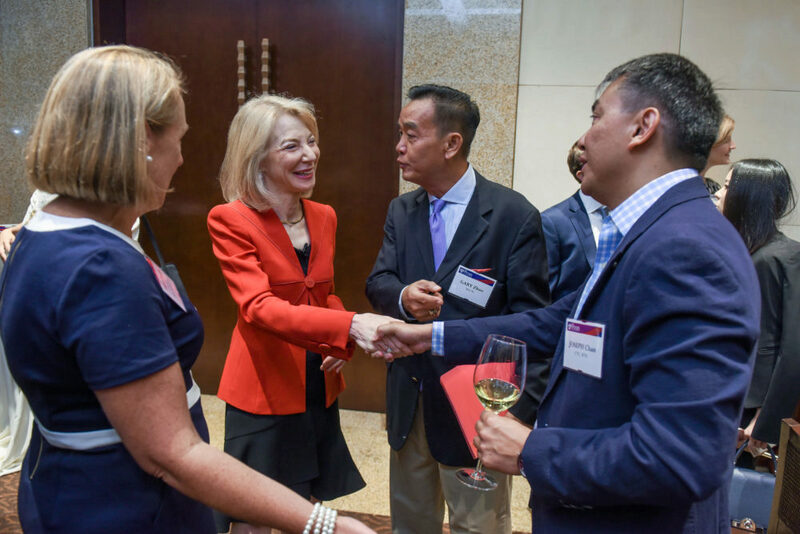 Image: Penn President Amy Gutmann at the all-alumni event in Beijing on September 7, 2018. The Penn Wharton China Center welcomed President Amy Gutmann to Beijing, where she discussed the growing connection between Penn, China, and the world. 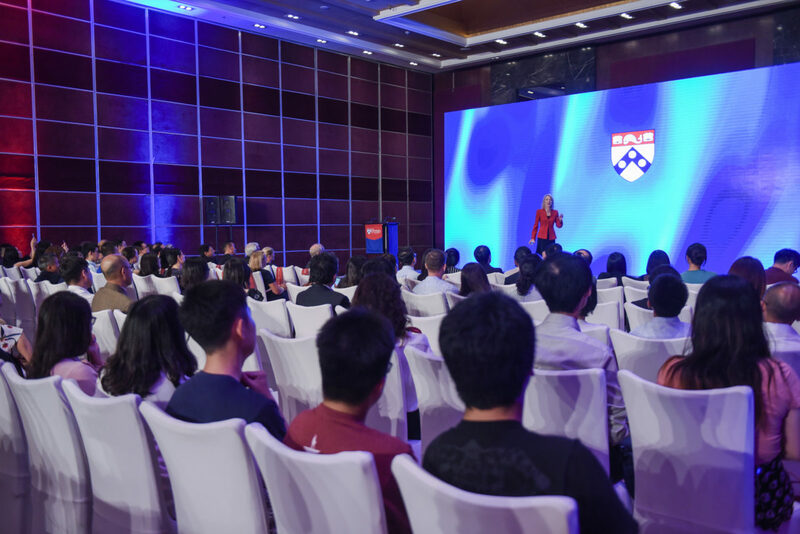 The Penn Wharton China Center (PWCC) once again welcomed President Amy Gutmann to China this month. Many alumni, students, faculty members, and partners attended a reception in Beijing on September 7, where Dr. Gutmann presented. Here are some highlights from her speech. I want to give you a vision for Penn and China. This started with and is built on our more than two centuries of collaboration. Penn has enjoyed a truly long and rich history of engagement with China. According to University records, the very first China-based Penn Alumni Club was started in the late 1800s, and Penn has nurtured many well-known experts in China, including Liang Ssu-ch’eng, the “Father of Modern Chinese Architecture,” and Phyllis Whei-Yin Lin, the first female architect in modern China. In 1980, Penn and Shanghai Jiao Tong University joined together for educational exchange – a partnership that continues to this day. As of today, all of Penn’s 12 schools have partnerships and engagements in China, and we currently have more than 20 agreements with more than a dozen Chinese partner institutions. These broad partnerships have benefitted both Chinese institutions as well as Penn students, alumni and faculty. 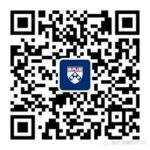 To further support knowledge sharing and exchanges with China, in 2015, we established the Penn Wharton China Center. This not only represents a milestone in Penn’s two centuries of engagement with China, but the Center is also an important hub through which Penn students and faculty can further grow exchanges with China. Dr. Gutmann at the all-alumni event in Beijing thanking Penn’s alumni clubs in China for their phenomenal levels of engagement. As of Fall 2017, the Penn campus was home to 1,916 undergraduate and graduate students who are citizens of China, accounting for nearly one third of all international students. China has contributed the largest number of students to Penn outside of the United States, and China is one of the top five destination countries for Penn graduates. All of Penn’s 12 schools have at least one partnership with a Chinese institution or have China-focused activities underway. At Penn, our approach and commitment to inclusion equalizes opportunity and enriches the experience of all members of Penn’s community. Inclusion is exceptionally important as it allows us to bring the best and the brightest to Penn. There are disruptions in the world, which makes our mission as a U.S. university with a global perspective of bringing people together even more important. Since becoming president in 2004, Penn has significantly improved diversity within the undergraduate student body, with steady growth in underrepresented minority enrollment and growth in international student representation, particularly among students from China. Penn has also taken huge strides in enabling students from all walks of life to join and enrich the Penn community through our extensive financial aid program. Financial aid plays a key role in supporting diversity and we are extremely proud to have financially enabled a significant proportion of the student population since our all-grant program launched in 2008. This means that, on average, one-quarter of first-year students are either First Gen or from low-income families and Penn has met all demonstrated need with grants. We understand the financial burden that university studies place on families and students and are proud that more than half of Penn students graduate with no debt whatsoever. We are so pleased to financially support students — this results in a huge ripple effect for students, their families, and society. At Penn, innovation is much more than traditional patenting and technology transfer. It is about intersecting creative thinking with deep understanding to bring about better approaches to solving the challenges of the world. Importantly, it is about creating an innovation ecosystem that fosters a fluid exchange of ideas and expertise across a broad spectrum of new and established knowledge. Penn’s world-renowned multidisciplinary professorships are unique in higher education and Penn remains the destination for interdisciplinary inquiry with 12 schools on a single, continuous campus. To help drive innovation, we launched the Penn Center for Innovation, which fast-tracks Penn technologies to meet social and environmental needs, and the Pennovation Center, which serves as a flagship business incubator and laboratory where researchers, entrepreneurs, and industry partners collaborate to solve pressing real-world problems. To date, 40 undergraduate-founded startup companies are associated with the Penn Center for Innovation, and undergraduate students remain core to Penn’s interdisciplinarity and innovation, with 71% of our students pursuing interdisciplinary studies. All over the world, Penn students, alumni, and partners continue to change the world through research and collaboration. Through the President’s Engagement & Innovation Prizes, Penn graduates have had a significant impact in Chicago, Mexico, India, China and around the world. Meanwhile, at the 2018 Silfen Forum, Penn faculty and invited guests tackled the pressing global issues of refugees and immigration, while in early 2018, we launched the Penn Biden Center for Diplomacy and Global Engagement in Washington, D.C., to advance the much-needed dialogue on globalization and to engage a new generation. In Asia, Penn’s impact continues to grow. Since 1990, we have seen a huge increase in Penn students from Asia and as of spring 2018, we now have 15,200 Penn alumni living in Asia of which 3,466 live in China. Our faculty presence has also grown with hundreds of Penn faculty actively working in Asia and many University or school-based programs in Asia, while annually Penn commits $35 million for Asia-based sponsored research. To conclude, while the world may change, Penn’s commitment to global engagement and world-class academic pre-eminence is as stead fast as ever, and we are even more excited about our future here as we expand and enhance our initiatives. I would like to thank you all for your continued support as we work toward delivering the Power of Penn and to advancing knowledge for good for future generations to come. This story was adapted from an article that was originally shared on WeChat. Connect to PWCC’s WeChat account by scanning the QR code below. Dr. Gutmann took questions from the audience of alumni, students, faculty members, and partners at the reception. How can Penn help to improve U.S.-China relations? I believe that our core mission to promote educational diplomacy – bringing people from all over the world together – allows us to share and deepen our understanding of our commonalities and differences. This is how we will move forward. We all must think uniquely, but stand united not despite our differences, but because of them. We can always do more together than apart. As the world becomes more international, how does Penn prepare students to be more globally minded? Penn offers an incredible array of faculty, expertise, and courses. This is important, because to be globally minded you must understand different economies, systems, arts and scientific fields. We bring so many different elements together and we invest in them to deepen understanding and to give our students a global perspective. How does Penn stimulate and support innovations? Innovation is core to Penn and we drive and nurture innovation in so many ways through interdisciplinary studies. We have created what I like to call an innovation ecosystem at Penn that continues to grow. One key example that embodies this growth in innovation is the Pennovation Center. Since opening in 2016, we have expanded the number of commercialization agreements from 57 to 650, which is incredible. And for our students, we are about to launch our Venture Lab, which will be operated by faculty from Wharton, but will support all undergraduate students who can bring and apply their creativity to the world. What differentiates Penn from all other Ivy League schools? There is no other university like Penn. This is what differentiates us, we are 12 world-class schools on one campus — the greenest campus in the U.S. — with the strongest focus on interdisciplinary studies, inclusion, impact, and innovation, the most engaged students and alumni who live and breathe Benjamin Franklin’s spirit of putting knowledge to work to better their community, society, and the world. Inclusion leads us to innovation which allows us to have the greatest impact. And we have the best alumni in the world!